Ghunzul, an Orc bandit, is the leader of the bandits in Cracked Tusk Keep. He is the 8th of his family line to bear the blade shards of Mehrunes' Razor. 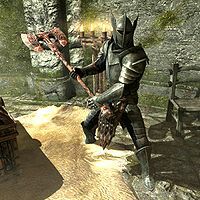 He wears a leveled set of heavy armor, which may be up to steel plate or Nordic Carved in quality, and is armed with a leveled two-handed weapon, which may be up to ebony in quality. He also carries a spare leveled dagger that may be up to elven in quality, and a leveled amount of gold. He may say to you, "Looking for the blade? You aren't the first!" This page was last modified on 3 September 2018, at 23:59.